A fresh, sweet, tangy salsa for Cinco de Mayo. My husband Jack really loves kiwi. He grew up in Florida so I always envisioned him growing up amongst kiwi trees. His grandfather was quite the green thumb and Jack always tells stories of the fruits and vegetables they would pick and eat together. He talks about kiwi so much that I had just assumed that this tropical fruit was part of that picture as well. Last week I when was trying to dream up a unique salsa recipe I thought kiwi would be fun, different, and most importantly – Jack would love it. It’s not a fruit I typically reach for. To me it just seems more like a Florida thing that one should eat while in Florida if you have a magical fruity backyard. And that’s when I was shocked to find out that kiwis don’t grow in Florida at all (they grow in California & New Zealand)- he just coincidentally likes kiwi and his childhood kiwis came from the local Publix. Which makes for a way less charming story but, stay with me, this green salsa recipe is delicious nonetheless. 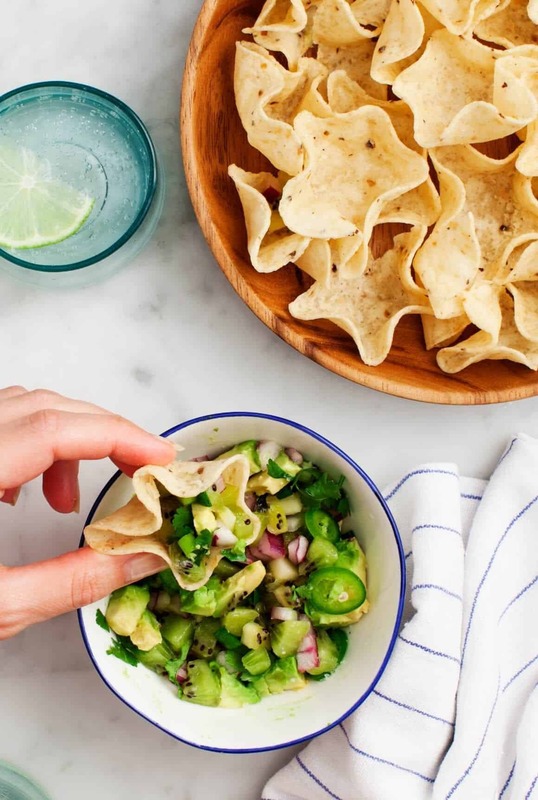 This salsa is bright, tangy & slightly sweet – plus, I just love it’s gorgeous green color. 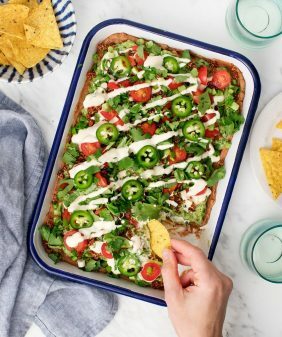 It’ll be so perfect for your Cinco de Mayo gatherings this week, especially when accompanied by the perfect tortilla chip. Living in Austin, I’ve become very particular about my tortilla chips, which is why I’m excited to partner with my favorite chip brand – Garden of Eatin’. 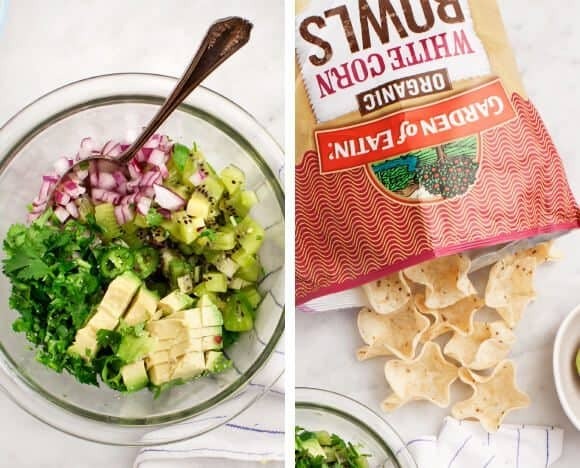 I’ve been buying their chips for years – I love how they’re made with organic corn and only 3 non-GMO ingredients: organic corn, oil and sea salt. To me, good quality simple ingredients always tastes better. Their new bowl shaped chips (p.s. how cute are they! I think they look like little stars), are perfect for scooping up fresh salsa. In a small bowl, combine kiwi, scallions, avocado, cilantro, onion, lime juice and zest, garlic, jalapeño, if using, and generous pinches of sea salt. Season to taste with additional sea salt and/or lime juice. Serve with Garden of Eatin' White Corn Bowls. *If raw red onion is too bitter for you, rinse it under cold water to remove the bitterness. Dry before adding to your salsa. This is a sponsored post in partnership with Garden of Eatin’. I was compensated for my time, however, as always, opinions are my own. Love the kiwi!! That is such a great idea to sweeten it up and keep it green! This is so good!! I would never have thought to add kiwi in a recipe like this one – but it’s absolutely brilliant! Such a clever use of kiwi! Great idea. I always make mango salsa, but this is a pretty alternative! Kiwi is such an underrated fruit. I’m excited to try this out in a salsa! My salsas are usually just so traditional, so it will be fun to try something new! And those chips do look so cute! Kiwi in salsa is a brilliant idea, how have I not thought of this before?! I’m always up for a new salsa verde recipe! Love this idea! How perfect for Cinco De Mayo today! 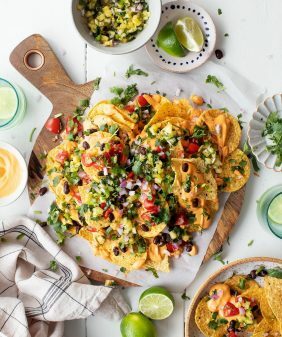 Just made this for Cinco de Mayo and it is sooooo good! I’ve tried mango, pineapple, watermelon salas/guacs before but never kiwi and this is by FAR my favorite!!! LOVE LOVE! Thank you so much for sharing! What a unique idea to include kiwi! I’ve never tried anything like it! What a refreshing twist! I’m going to bring it to the next BBQ. Thanks for sharing! Whaaaat??!?!?! Is it for real? O gosh, it looks so amazing! 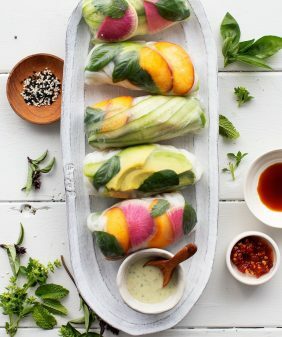 So yummy and quite easy to prepare! You just gave me the recipe for my dinner! Cab´t wait.. yummy! OMG! 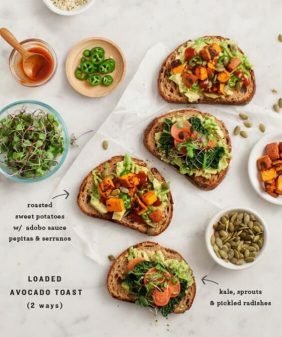 This recipe looks yummy! I will try at home! OMG! 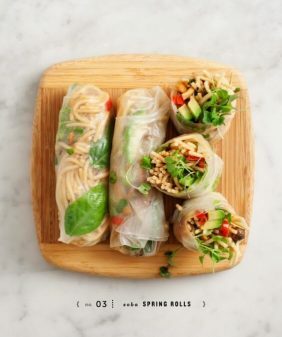 This recipe looks yummy!